Deploying agents to clients can be as varied as the clients themselves. You may not need to monitor the computers at your bakery client the same way as you do at that law office. GFIMAX currently addresses it a couple of different ways depending on the deployment scenario you're talking about. New client deployment; unknown assets; mass deployment via silent installer. In this scenario you don't necessarily know what's on each machine: could a machine purchased at Best Buy be lurking on the network and have a 'free' copy of McAfee still installed along with the company's license for Trend Micro? So; install without any template and let the auto-discovery process populate the dashboard. 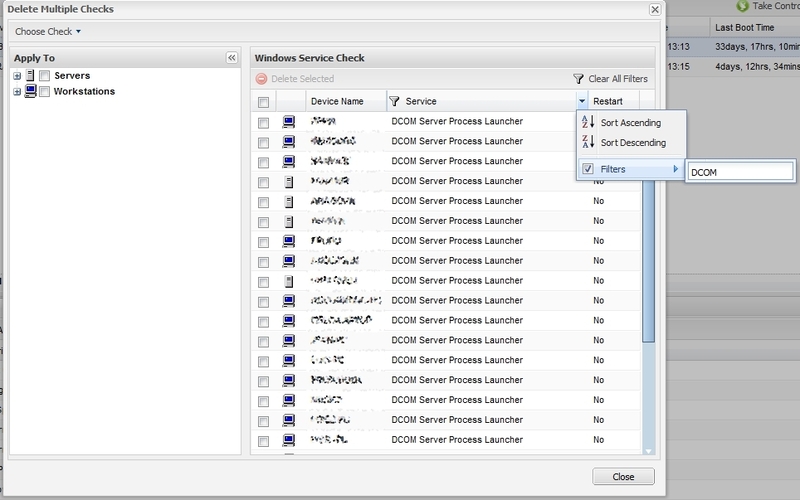 Once the machines are in the dashboard, simply select one, select a check you may want to remove ("FAX" for example) , then select "Delete Checks Like This" from the Checks menu. 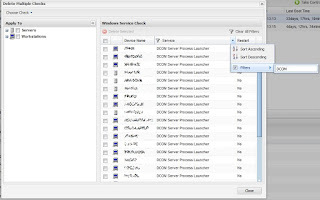 A dialogue box showing all systems that have a (generic) Windows Service Check will appear. Each column has a filter pull-down menu: simply enter the appropriate name filter and the list will be pared down to just what you need to see. You can also limit the list to just a certain Client or Site, or just Servers or just Workstations, etc. Then click the selection box at the top of the list to select them all, and click OK. A confirmation of how many agents are affected appears, and you're prompted for your logon password (as you are when you delete anything as this is not a reversible command). All gone. Existing client with known configuration; mass deployment via silent installer. If you know (most) everything on the systems in question, create an Installation Template for the entire Client and/or Site. 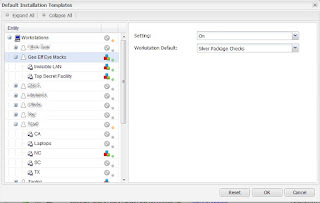 (Settings --> Monitoring Installation Templates --> Manage Templates) The easiest way to create a template, however, is from an existing machine in the dashboard; that's found from the Server/Workstation menu. Once the appropriate template is created, apply it using the "Set Default Templates" selection in the same place above. You can cascade inheritance to any number of levels similar to the way Take Control, Patch Management, etc. are deployed. If you want to add anything, you can use the File --> New Check selection to add to one or more machines once they're in the dashboard. Packaged Monitoring Services. You can set up an Installation Template for just the items you're going to monitor for the client. For instance: a low-end monitoring package may include Daily Checks only. Maybe you're going to monitor only the Backup jobs and the Anti-virus updates. (That sounds eerily ... familiar ... doesn't it? Where ... oh - nevermind) Create a template for each one of these levels and assign it to the client as they sign up. Deploy the method by any means you feel best suited and the template is applied during the first check-in of the agent. If you want to add anything, you can use the File --> New Check selection to add to one or more machines once they're in the dashboard. Manual installation; partially known. During a manual installation, there is a step that asks what Client and Site the agent will report into. There is also a pull-down menu for the Template you'd like to use. 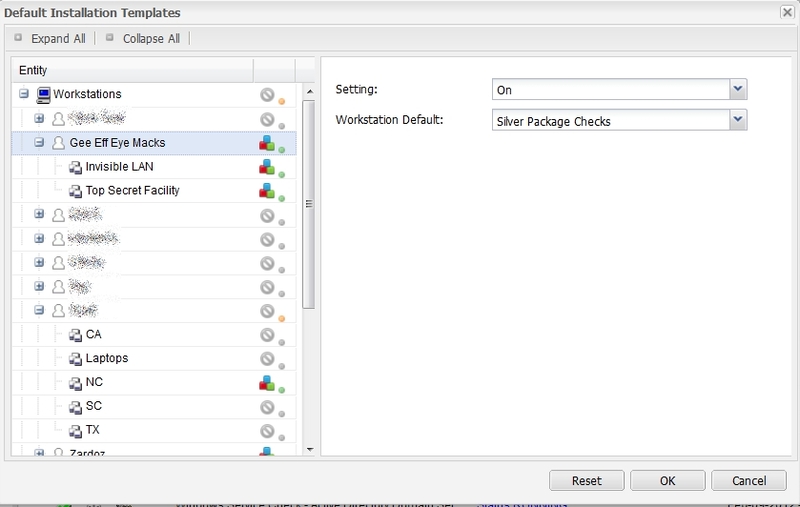 If you have a package of checks (Bronze/Silver/Gold for example), you can select the template at that time, then step through wizard with it already populated, but still have the opportunity to modify if/as needed. Of course, these are "typical" scenarios; how you apply any and all of them can vary to what your situation requires. For more about Templates, refer to the chapter in your help documentation in the dashboard. Currently these templates are installation templates only, so you'll have to plan ahead. Soon we'll have the ability to apply a template that exists in your dashboard to an agent that exists in your dashboard.